Publication details: Book. 2017. 432 pages. Publication date: 2017-10-16. Just when I thought I can barely accept the level of incompleteness of this work, my eye drops on a new scientific article or a new insight of which I think it should be added to this book. The one that flabbergasted me today was that there is a significant correlation between the weather and Ménière's disease. The lower the atmospheric pressure and the higher the humidity, the higher the risk for a Ménière attack. This example illustrates that science is about an emerging truth. Day after day, we try to understand nature, and by performing repeatable scientific experiments and clinical trials, we try to unravel the mechanisms behind certain observations and diseases. Old ideas and opinions have to be replaced with new findings and insight. In case of vertigo, I'm delighted to see that the past decade, many new discoveries have been made to better understand the dizzy patient. 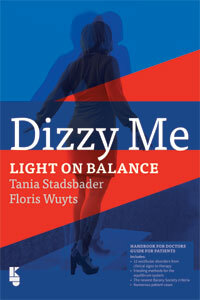 The first Flemish edition of Dizzy Me published in 2010, covered only half of the twelve vestibular disorders that I discuss in the current book. The newest scientific criteria of for example Ménière's Disease (2015), Vestibular Migraine (2012), Vestibular Paroxysmia (2016) and Persistent Postural Perceptual Dizziness (2017) are described. This book also tries to build bridges and fill in gaps. This is one of the few books where the voices of the patients are put together with the voice of the clinicians and scientists. The science tries to explain the cause of the disorders, while the voice of the patients explains how the symptoms are experienced, from morning till evening. This provides a unique cocktail of stories of patients seeking help and trying to understand what is going on in their heads mixed with the pure science of explaining certain mechanisms behind these sensations of vertigo. I hope this book will help many more dizzy patients to understand their complaints, and to guide clinicians in their search for a cure of the dizziness. It is certainly no rocket science. I thought it might ruin my career. But nine years ago, something urged me to begin the online blog that ultimately became this book, hoping that it might help others in my position. I was thirty-eight, married, had three kids, was working in marketing, hyperactive and driven. From the outside, I seemed to be in good health, but for the last fifteen years I had been subject to attacks of dizziness. To look at me, you would think I was healthy ‒ which meant my journey towards relief was lonely and difficult. Different doctors offered different diagnoses, all shots in the dark, none of them helpful. The medical profession didn’t know what to do with me. Were they even taking me seriously? I wanted to puncture the myths about my condition. We Dizzy Deans and Donnas are not drunk or crazy. We are not imagining things. It’s not just ‘all in our heads’. And that’s why I wrote my book. I ripped off the mask I had been wearing for fifteen years, gave my disease a face and a name ‒ and the result was Dizzy Me. The book sold out quickly, and its effect on my career was, all things considered, more positive than negative. Of course, when I apply for a job I get Googled, and it’s easy for prospective employers to learn my history. Which makes them cautious. Vertigo is a form of dizziness ‒ though not the only form, as some doctors seem to think. It hits you at the most basic level imaginable. Sometimes it pops up out of nowhere, completely unexpected. Sometimes an attack drags on for what feels like an eternity. It robs you of your self-confidence, makes it impossible for you to stand, walk, work or live like a normal person. You are constantly afraid that the next attack is waiting to strike. Its causes are so complex that many sufferers can’t get a conclusive diagnosis. And when your illness is invisible, it’s hard for other people to understand what you’re going through. No wonder that many of my fellow sufferers have been curious about the human being behind Dizzy Me and have reached out to me. In return, my book has reached out to many of them. It has given them hope. But we have still got a long way to go. I want to tell my story to doctors, too, to nurses, caregivers, physical therapists. There is so much work still to be done. And that’s why I have revised the book now, and why I have crowd-funded this English translation. Floris, my wonderful co-author, has stood by my side all along, and I remain ever grateful for his support. I hope that the audience we are trying to reach will carefully read his Handbook for Doctors, which consists of Chapters 5-7 of this volume. Nine years have gone by since my surgery in 2008. Today, I feel nine years younger… and I am the proud mother of twins: the third Dutch edition and first English edition of this book I have titled Dizzy Me. Shedding Light on balance. And very proud to annonce another little sister to be published soon: my first child book ‘Wobbly Wilma’. This is a remarkable book. The section written by a patient impresses the scientist with its accuracy, while the vestibular expert’s contribution will add significantly to a hobbyist’s knowledge. Dizzy Me brings patients and scientists together. As a doctor with 30 years’ experience treating vertigo and great interest in therapeutic possibilities for those with compromised oculo-vestibular systems and visual vertigo, I’m impressed with the English edition of the book. It will acquaint people around the world with a more ‘balanced’ approach to the vestibular system. With its striking and completely original style, Dizzy Me captures the physical and emotional pain of an incorrectly diagnosed BPPV patient. The concept of painting a complete picture of an illness by combining a patient’s detailed autobiographical history (the questions) with the most up-to-date medical insights (the answers) works extraordinarily well, making this volume required reading for anyone who is interested in balance disorders. What may appear at first glance as yet another patient’s autobiographical rendering of personal anecdotes and misdiagnosis is in fact a fascinating and often witty recollection of a real determination and the struggle to be acknowledged, to be taken seriously, to be cured. The balance between the diary-like storytelling and the scientific elaboration of Professor Floris Wuyts on canal plugging and topics related to the subject of vertigo will no doubt bring hope and new insight to a lot of people. This is a tremendous compendium on the topic. A must for patients, doctors, therapists and everyone who needs in-depth information. This book is unique. It highlights the patient experience and presents current medical insight into the workings of the vestibular system. It reveals how radically a balance disorder can impact a patient’s daily life, and also shows how challenging it can be to diagnose and understand disruptions of the vestibular system. Dizzy Me brings patients, scientists and ENT doctors together. As a professor of ear, nose and throat illnesses with significant interest in hearing and balance disorders, I’m very pleased to see this book, with its ‘well balanced’ approach. A colleague recommend this book to me. I’m a doctor, and I’ve been wrestling for 13 years with my own vestibular issues and their effect on my quality of life, my environment, and my work. The search for proper diagnosis and effective treatment can be frustrating. I recommend Dizzy Me to patients, therapists and doctors who want greater insight into the challenges of living with a vestibular disorder. Dizziness is scary but not such a terrible thing. That’s the way it generally looks to outsiders. For those who are subject to regular attacks, though, it can be a torment. Dizzy Me brings personal experience and scientific expertise together in a single volume. Tania Stadsbader’s story is compelling, and Floris Wuyts adds invaluable scientific knowledge. I read this attractive and clearly written book with great interest. It’s helped me to better understand the world in which our daughter Willemijn unfortunately lives. I recommend it to doctors, patients, and especially to those with personal connections to the afflicted.